I scream, you scream — we all scream for ice cream! Sunday is National Ice Cream Day, which means it is perfectly acceptable to gorge oneself on the delicious treat. 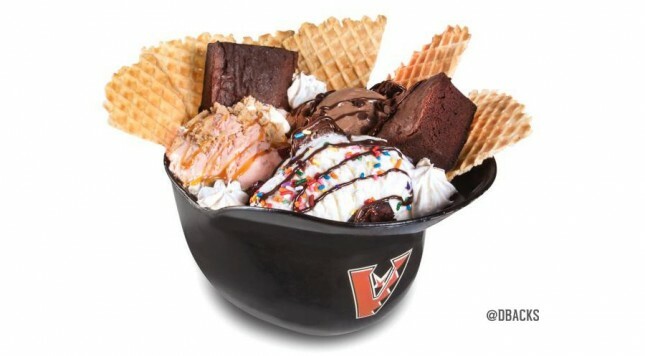 However, the Arizona Diamondbacks are taking this day to a whole different level, offering a two pound ice cream sundae. The #Dbacks Triple Play Sundae includes 15 delicious ingredients and weighs in at just over 2 pounds (including the souvenir helmet). Those 15 delicious ingredients include three scoops of Cold Stone ice cream and plenty of crazy toppings, including chocolate and caramel syrup, waffle cone pieces, brownies, and sprinkles. The massive concoction adds up to a supposed 3,500 calorie celebration of National Ice Cream Day. For those of you worried about health, the Diamondbacks are marketing this as a family treat to be enjoyed by more than one person. How much do you want to bet we see a whole family with their own one of these for each person in said family this weekend?